Hello everybody and welcome to this, the second edition of SW & C Jackson Life. Through this periodic newsletter, I hope to keep you abreast with practice life, offers you may be interested in and interesting optical titbits. I cannot believe that we are already into March, such a dash to get everything organised for Christmas and then it was gone in a flash. The New Year has seen us reassess the way we help our patients to select their spectacles and lenses. Modern lenses are carefully designed to deliver the best vision possible to the wearer and they are available in a wide range of designs, materials and finishes. Understanding which lens will suit you best can be confusing – especially when you are looking at some of the modern varifocal designs – and do you want them to change colour with the light? Do you want them thinned down to make the lenses look neater and feel more comfortable in wear? – It’s enough to make your head spin! We have therefore invested in a Nautilus Lens Demonstrator to show our patients the difference between a tint and a polarised lens, to see the benefits of anti-reflection treatments and to experience for themselves the differences between different varifocal designs. Nautilus uses virtual reality – look into the mask and you are transported into a car at night to experience Road Pilot, the new driving lens or a dazzling river to experience the benefits of Polarised Sunglasses. We are delighted with it as it makes our job of explaining the difference between products so much easier and helps patients make an informed decision. Recently the NHS stopped supplying nutritional supplements to patients with Age Related Macula degeneration, such as Macushield, on prescription. A number of people have asked me what they should do now? My best advice is that if you can afford to purchase the supplements yourself then to keep taking them would probably be the best thing to do in conjunction with eating 6 portions or more of colourful fruit and veg every day and protection your eyes from Ultraviolet Light (UV) by having a UV blocking filter on your everyday spectacles, wearing sunglasses if you do not need to wear glasses generally and wearing a hat with a brim to protect against vertical rays. Oh yes, and stop smoking if you do! At the beginning of January, one of our patients arrived at the practice in a bit of a flap. She had fallen and broken her only pair of varifocals. Not only did she have two black eyes and a sore nose but she could not see to drive or read. Fortunately, although the lenses were badly scratched, the front of the frame was intact and we managed to affix a pair of none matching sides to tide her over till her new specs arrived. This was not the best way for her to choose her new specs as she felt flustered and uncomfortable. Happily her new glasses came through in less than 2 weeks thanks to the Lab fast tracking our order and normal vision was restored! The moral of the tale is therefore always having a spare pair of specs because you never know when you might need them. Today, everything has changed. We live in a 24/7 connected world, where multitasking is part of our normal life. With our behaviours evolving, our visual needs are also different from what they used to be. Our posture and the way we look at things have changed. Everything that matters happens within arm’s reach and that’s why your near vision and what you can see between 40-70cm is so important. 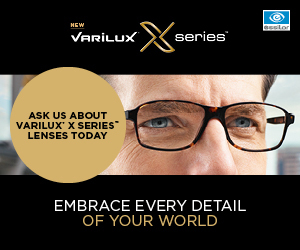 Acknowledging today’s new visual needs, the Varilux team of experts have developed the new generation of Varilux lenses, Varilux X Series. Until the end of March, if you purchase a complete pair of spectacles including Essilors’ X Series varifocals, we can offer you 50% off a second pair of Essilor X series lenses. This could be used for sunglasses or in order to generate a spare pair. X Series is the first Varilux lens to dramatically reduce head movement and so ensure your vision is as natural as possible within arm’s reach and beyond for everyday activities. Our posture and the way we look at things has changed. We drink coffee whilst texting, sending emails on our tablets, whilst checking social feeds on a regular basis. The X Series is the first Varilux to be designed with these modern behaviours in mind – gone are the days of having to point your nose at what you want to look at. In mid-January Felix took part in his first Park Run He competed at Penrhyn Castle, a National Trust Property that lies just across the water from us. He managed a creditable 29 minutes which was not bad for a first go on a hilly course. We have just got back from run number 2 (in the rain – well it is Wales!) and he managed to shave over a minute off his time! A couple of weekends ago, Robert and I went with some friends to watch Wales play Scotland in Cardiff. A good weekend was had by all but I don’t think Robert (Scots by birth) was too happy with the result! I reassured him that there was still time for Scotland to show improvement and that the word “Whitewash” will not be used again! 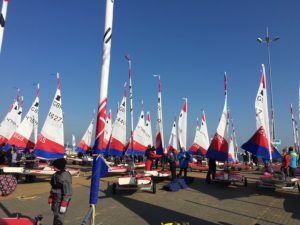 Sure enough while we were down in Weymouth with Felix at a National Topper Class Association sailing competition, Scotland came through to beat England in the Calcutta Cup. Needless to say, Robert was overjoyed and stopped complaining about the long drive and appalling weather for a couple of hours! 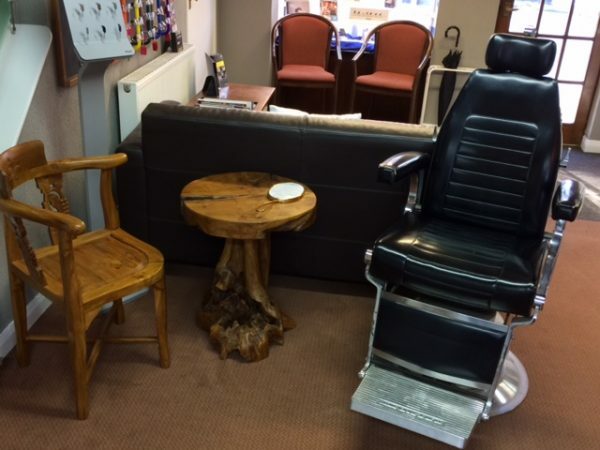 We needed to arrange another area for patients to sit whilst having their new glasses fitted. I wanted something a little quirky so we have pressed into action our old Eye examination chair and I could not resist this Teak Root table to go with it. * Not currently in stock!!! !